A neighbor of the Joads in Oklahoma, Muley Graves compulsively refuses to leave his land despite having been evicted. He hides on his former land, sleeping wherever he can, hunting for food, and remembering his own and his family’s personal history with the land. Muley also imparts advice to Tom about the repercussions of standing up to the authorities and then finding yourself hunted, foreboding Tom’s eventual situation. 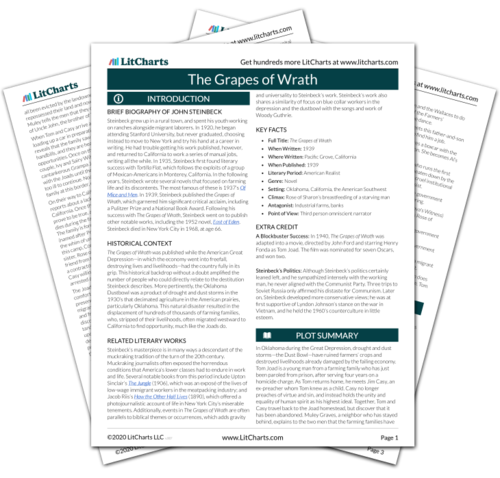 The timeline below shows where the character Muley Graves appears in The Grapes of Wrath. The colored dots and icons indicate which themes are associated with that appearance. Sobel, Ben. "The Grapes of Wrath Characters: Muley Graves." LitCharts. LitCharts LLC, 17 Sep 2013. Web. 21 Mar 2019. Sobel, Ben. "The Grapes of Wrath Characters: Muley Graves." LitCharts LLC, September 17, 2013. 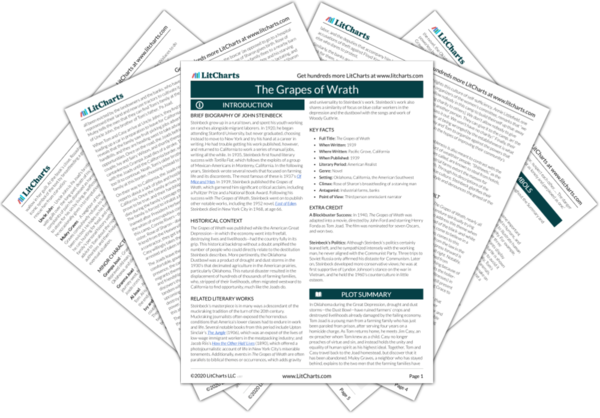 Retrieved March 21, 2019. https://www.litcharts.com/lit/the-grapes-of-wrath/characters/muley-graves.